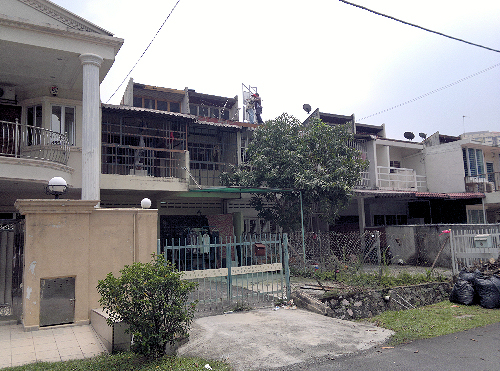 20130313 Microsolar 10 tubes Manifold Model being installed for Solar Air conditioning at Solar Dingin’s Showhouse in Ampang Jaya , Kuala Lumpur , Malaysia. 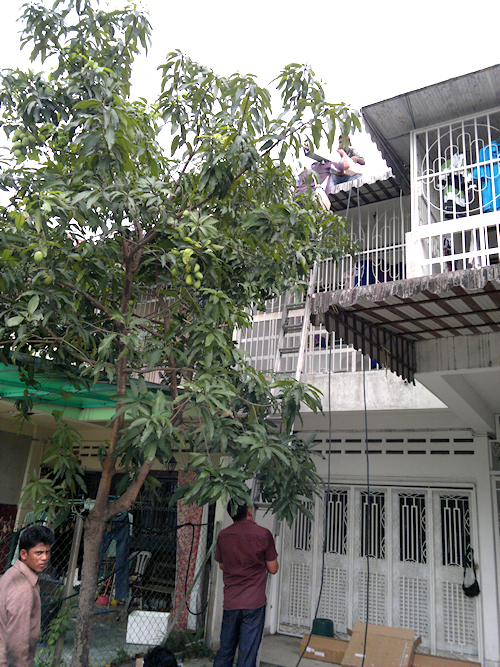 20130313 Installer Kevin Lim carrying the Microsolar Manifold model up onto the roof to be installed as a solar hybrid air conditioner at Ampang Jaya , Kuala Lumpur , Malaysia for our partners Solar Dingin Sdn Bhd. 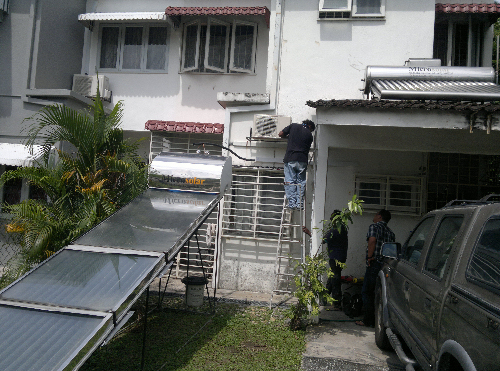 20130313 Installing the frame of Microsolar Manifold for Solar Air conditioner on roof at Ampang Jaya , Kuala Lumpur, Malaysia. 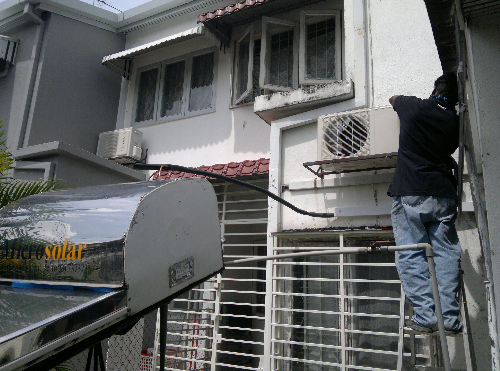 20120107 The 1999 vintage Microsolar being hooked up to an air conditioning unit at Microsolar’s showhouse in Subang Jaya Selangor Malaysia. 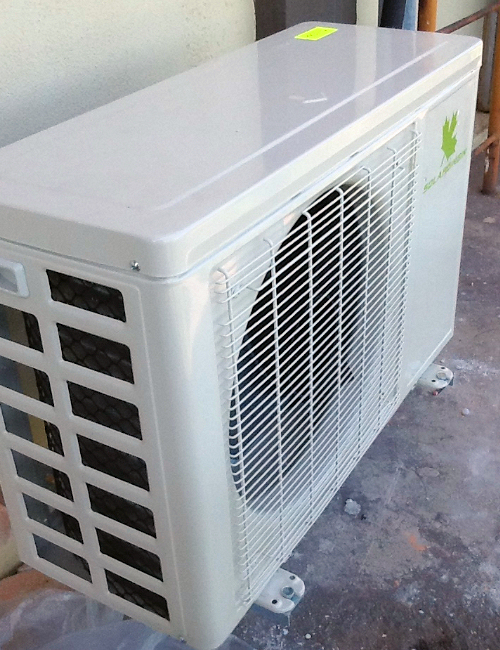 It runs a 1.5 hp 12000btu indoor air con unit . Without the Microsolar, running as a normal split unit air conditioner the normal electricity consumption is 5.6 amps x 240 volts = 1344 kw = 1.8 hp. 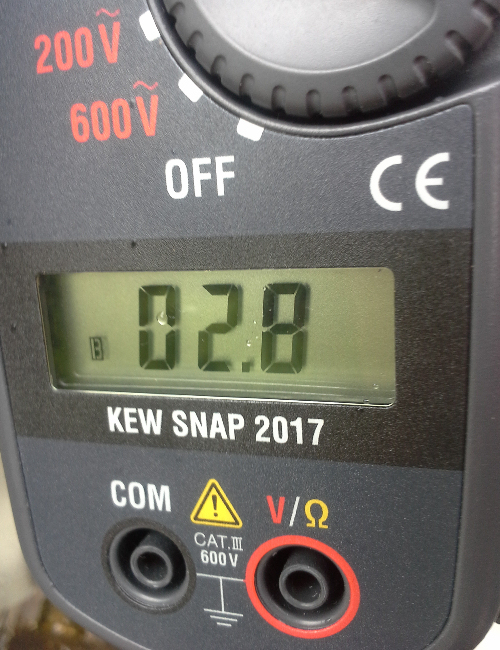 With the Microsolar hooked up, the electricity consumption drops to 3.45 amps x 240 volts = 0.828 kw = 1.12 hp. This is a savings of 38% of electricity with the Microsolar hooked up, it provides a free secondary heating or compression to the refrigerant by solar heating after the refrigerant exits the compressor and condenser. 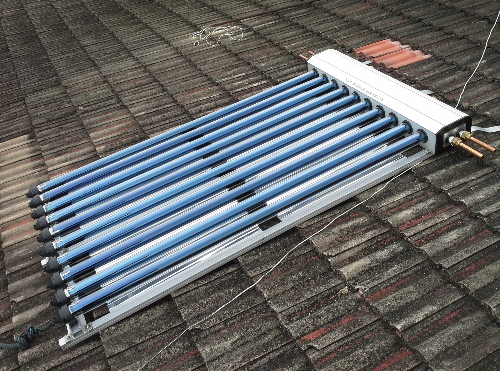 However this 1999 era Microsolar (based on the Nepal Microsolar of 1982) is bulky and not as hot as the 2013 Microsolar Manifold with Vacuum glass tubes. 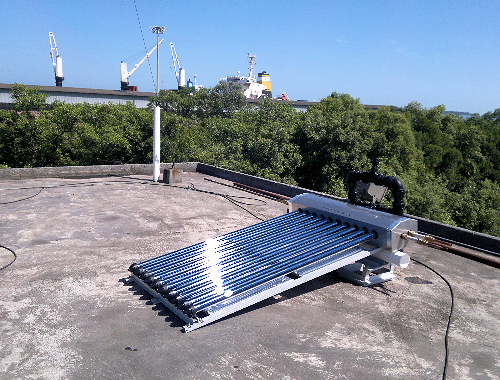 We had to use this old Microsolar Nepal model as our research protoype in Jan 2013 as it was the only unit left with openable tank that we could access the inside of the tank to fit the Air Con Heat Exchanger Coil . All our current models do not have openable tank. We have now custom manufactured the Microsolar Manifold as seen in the above pictures of March 2013 for these Air Cond applications which is more sleek and of much higher temperatures. 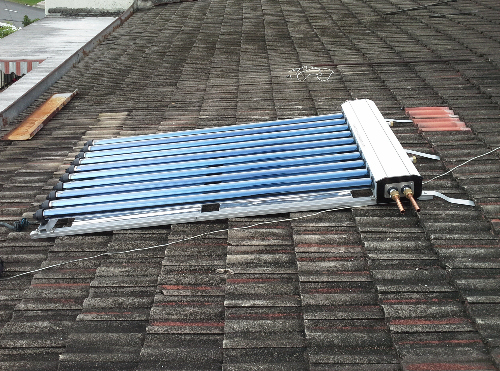 The Microsolar manifold can also be used for hot air heating and solar water heating with a remote pump circulation tank or with a thermosyphon tank above. 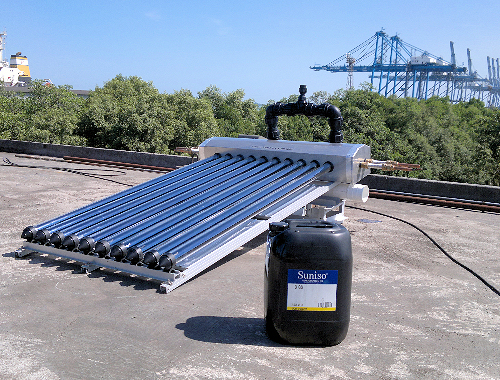 It is lightweight , and very suitable for roofs that cannot take the heavier loading of the normal Microsolar Water Heaters. 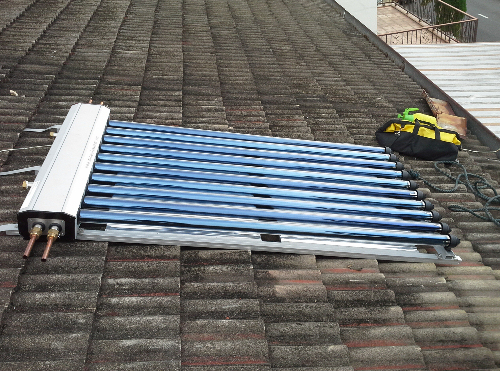 20130107 The original 1999 vintage Microsolar Nepal Protoype Model being converted to be used as a solar air conditioner and connected to the air conditioning compressor at Microsolar’s showhouse in Subang Jaya Selangor Malaysia. 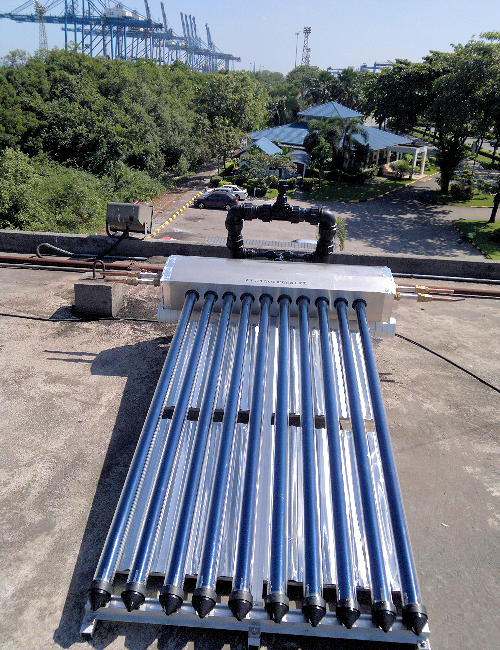 The current Microsolar Water Heater Vacuum Tube model can be seen on the car porch roof at top right. The Microsolar Hybrid Solar Air Conditioner provides a 38% savings on electricity usage when used as a solar air conditioner. 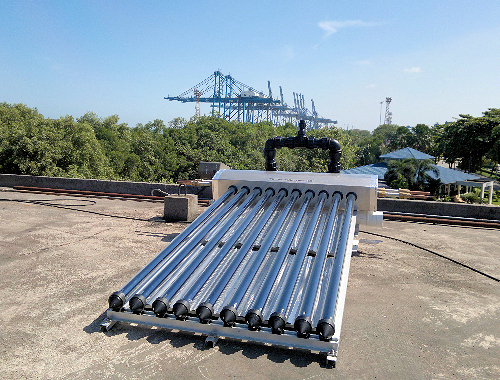 SOLAR DINGIN MICROSOLAR HYBRID SOLAR AIR CONDITIONER INSTALLED AT NORTH PORT , PORT KLANG, MALAYSIA JUNE 2013 WITH 40% TO 50% SAVINGS IN ELECTRICITY. 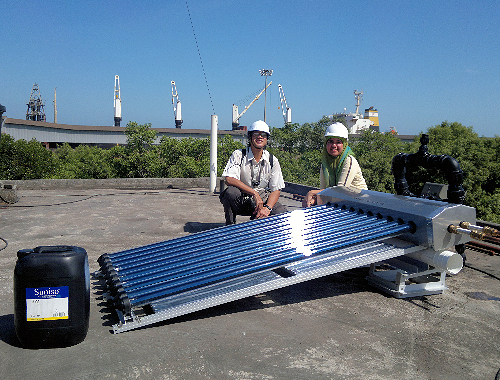 Microsolar Manifold unit of Solar Dingin Solar Air Conditioner installed at North Port, Port Kelang, Selangor, Malaysia. 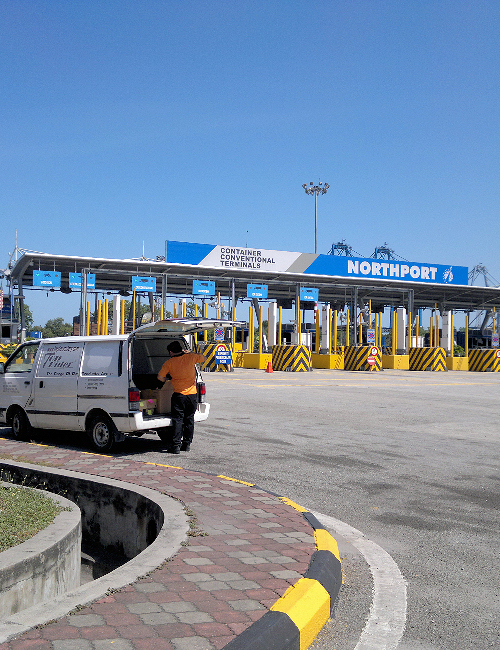 Entrance to North Port, Port Kelang, Selangor, Malaysia. 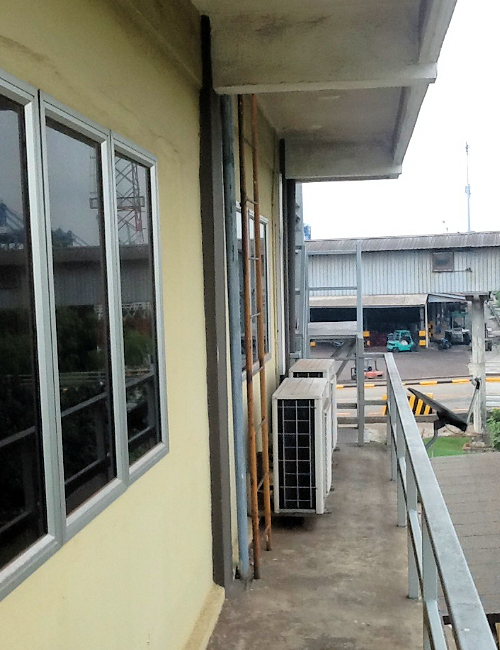 Solar Dingin Solar Air Conditioner 1.5 hp Indoor Unit completed installation inside Bomba offices at North Port, Port Kelang, Selangor, Malaysia. 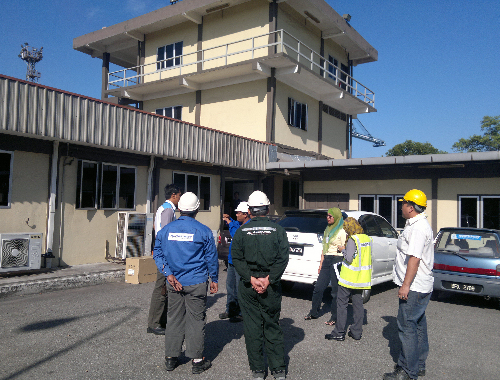 Safety Briefing by Bomba Officer before the installation at North Port, Port Kelang, Selangor, Malaysia. 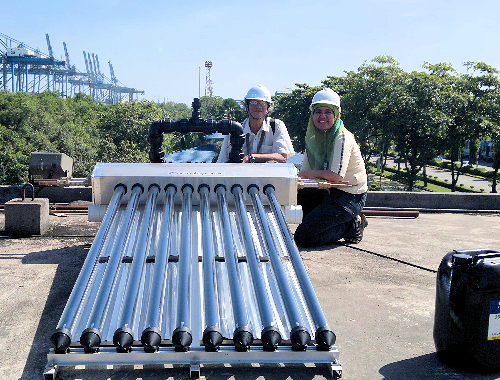 Siang of Microsolar and Azrina of Solar Dingin with the Alam Dingin Solar Air Condioner's Microsolar Manifold on the roof of the Bomba Tower at North Port, Port Kelang, Selangor, Malaysia. 20130709 upon testing after the Microsolar Manifold reached its operating temperatures, the Solar Dingin Microsolar hybrid air conditioner achieved 50% savings on electricity consumption, here the ammmeter shows 2.8 amps consumption. 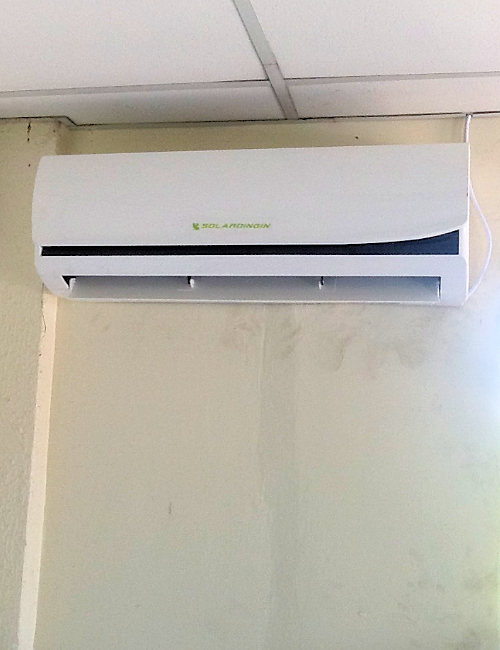 The normal consumption for this nominal 1.5 hp air conditioner is rated at 5.6 amps. without solar heating assist, which translates to 5.6 amps x 220 volts = 1232 watts (1.665 hp). So here, with solar heating assist from the Microsolar Manifold 10 tubes, running consumption is 2.8 amps x 220 volts = 616 watts or 0.832hp which equals 50% electricity savings.. And the room temperature achieved was 20C with 30C outside. Slight rain in the morning, sunny afternoon. Good job guys!